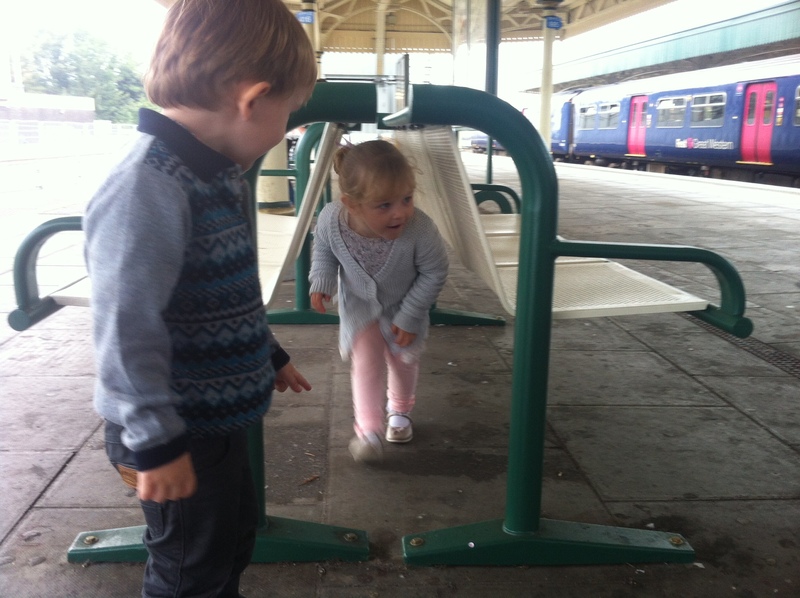 Adventures with Alfie and Millie – taking the twins to town. 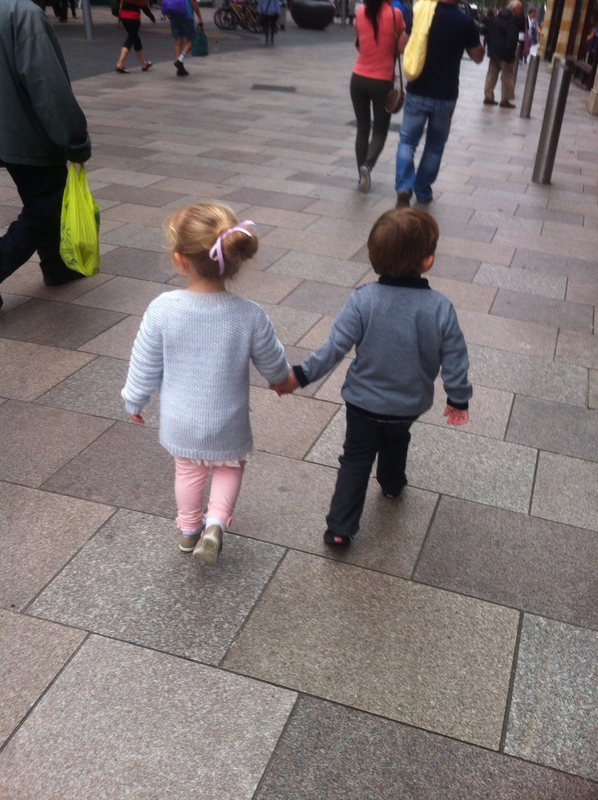 We took the twins to town today! Not that they are actually twins, but as almost every person we meet asks us if they are twins, we are nearing the point where we will just say yes and get on with it. The lady of the house always wanted twins anyway. 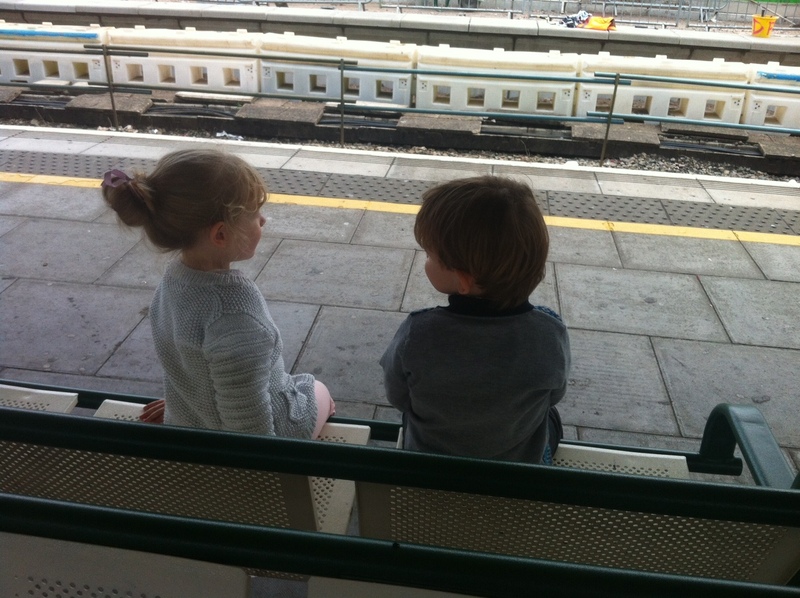 The truth is Alfie is three days older than Millie but they are just so close and incredibly wonderful company for each other. Big sister Mia is now in school full time and baby sister Lois is still in need of mum’s care… so it’s just the two of them. Alfie stayed overnight, so he was waiting patiently for Millie to arrive after her mum dropped Mia off at school. He had already given his approval to the lady of the house’s new project – the moving of the nursery to upstairs; maybe the name will change now to The Grandkids Room. It was Bes’s room but she has now moved out, so the kids are moving in! 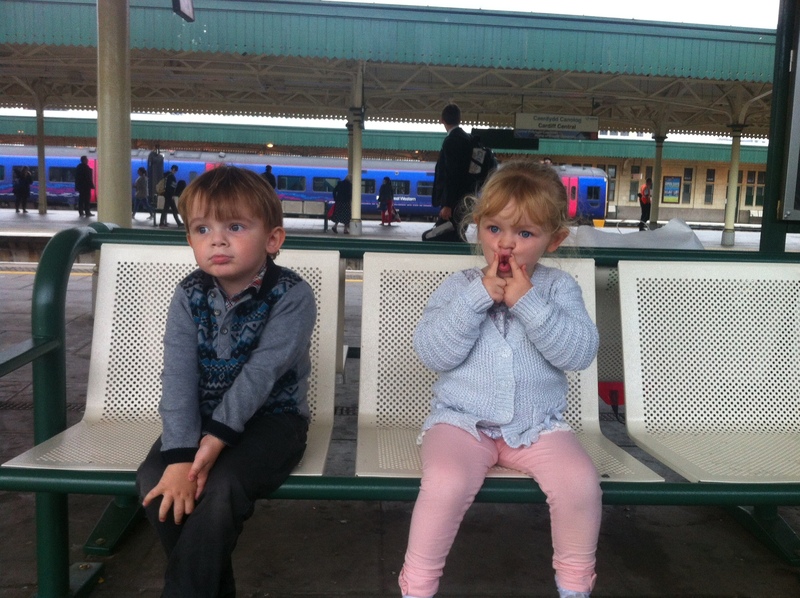 We decided to take Alfie and Millie to town by train; their excitement was tangible after we had told them. 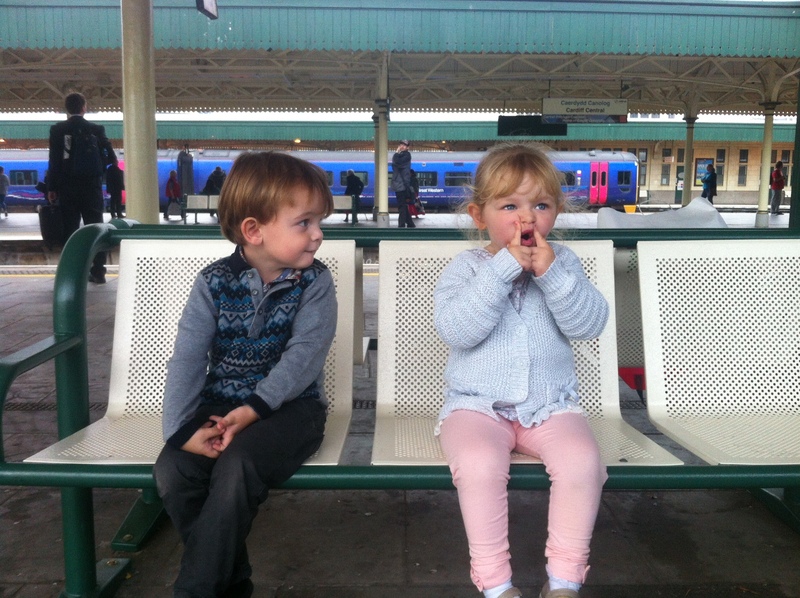 Millie was running around shouting ‘Choo, choo… we’re going on the train!’ Alfie soon joined it. It’s amazing the way they copy each other in so many ways. Somehow they managed to fit in time to watch Snow White for the 497th time, as us old ones were getting ready. I watched it with them for a while, turning the volume of the surround sound system to maximum and scaring them half to death at the scene where Snow White runs away from the huntsman. They adore that and Millie always has a mock panic attack at this point!! I must say though considering the film was made in the 1930s it is a complete masterpiece of cinema. We made our way to the station and the excitement mounted. Sadly no ‘Choo, choo’ arrived just an old diesel multiple unit. (Note to self – take the little darlings to Norchard as soon as possible). 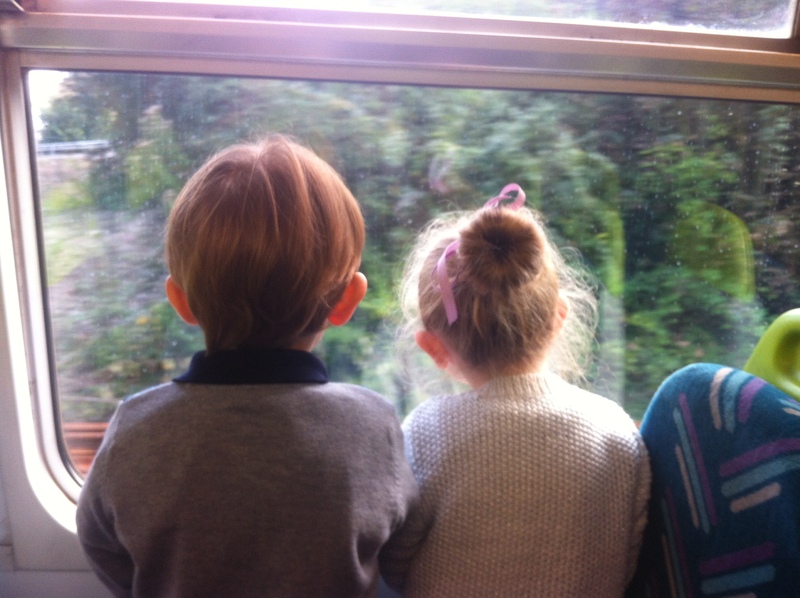 They loved the journey in, amusing all the other passengers as they knelt together looking out of the window and gave a running commentary of the whole journey. Our time in town was memorable and a great reminder that even an ordinary day can be a special time if you just look around and appreciate what’s happening. They walked a couple of miles for sure, without complaining once! 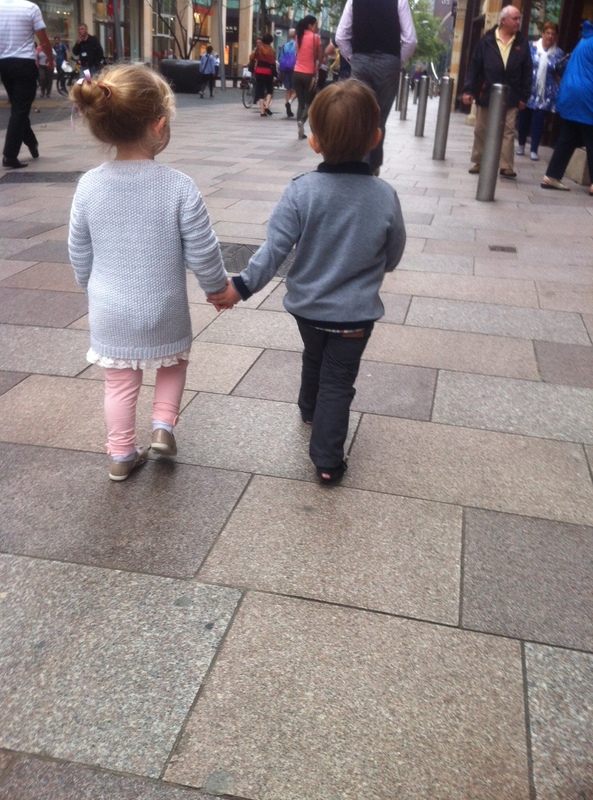 Many people commented when they walked hand in hand down the pedestrianised areas. I had to take a detour when Alfie yelled ‘Rog I want a wee!’ Fortunately Burger King was close at hand and luckily the first guy I asked gave me the code for the loo door. If he hadn’t I would have been one burger worse off or Alfie would have enjoyed town in wet trousers. Before too long, they were enjoying running round Laura Ashley diving on the neatly arranged cushions on the expensive sofas. The lady of the house was looking at me anxiously, gesturing the keep the kids still as she tried to pay for a new lampshade for the kids’ room. We all had fun. I was tempted more than once to join them and run around and dive into the cushions. Alfie and Millie would have loved it but I am not sure the lady of the house would have agreed with them. I would have been grounded for a week! It was Millie next who asked for a ‘wee’ and as there are no public conveniences in Laura Ashley, a look of panic appeared on my good lady’s face. Burger King was quite a way away! The kind assistant came to the rescue and offered the use of theirs. She had to phone the manager for permission and for the door to be opened and Millie’s dancing became even more urgent – but all was well. When the lady of the house eventually got back to the shop floor, Alfie smiled and announce his need to go again. The shop manager smiled but rolled her eyes and the procedure was repeated. While she was gone Millie and I dived on some cushions. When the manager came back with Alfie and the good lady, she looked over at me and I could see in her eyes that she was thinking ‘what about you old timer?’ I reassured her that I still had full control of my bladder and would not need to use her conveniences, but thanked her for caring thoughts and as we walked away I made a note to return my donation form for Help the Aged. 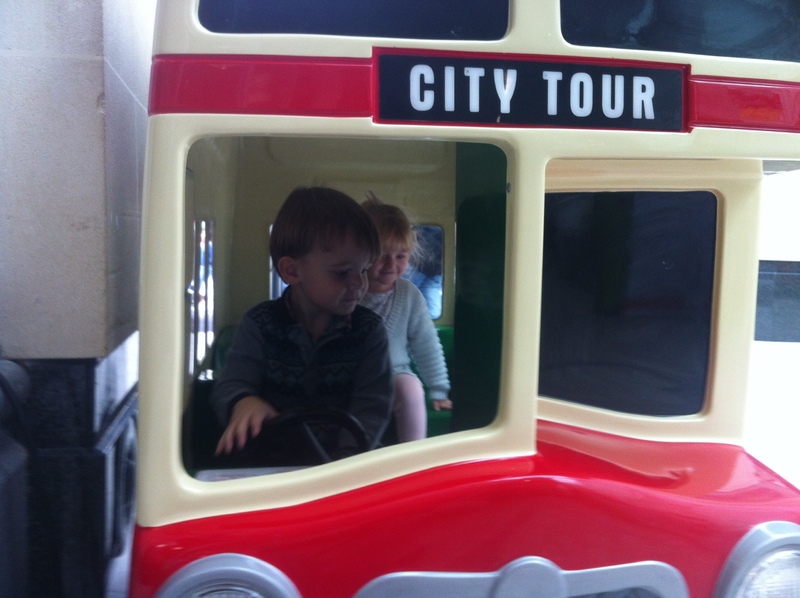 In St David’ Centre we passed a bus which Alfie and Millie just had to go on! How could we refuse!! Alfie HAD to be the driver! We strolled down to the market next to see the fish staring out from the counter in Ashton’s, my favourite shop in the world, but we had bought the little darlings a Welsh cake each from inside the market and their attention was distracted. I gazed lovingly at the cockles as we passed by, but I wasn’t due any pocket money… I looked at the lady of the house, who shook her head slowly. We made our way to Howells for lunch; at least it used to be called Howells and we will always call it by that name. 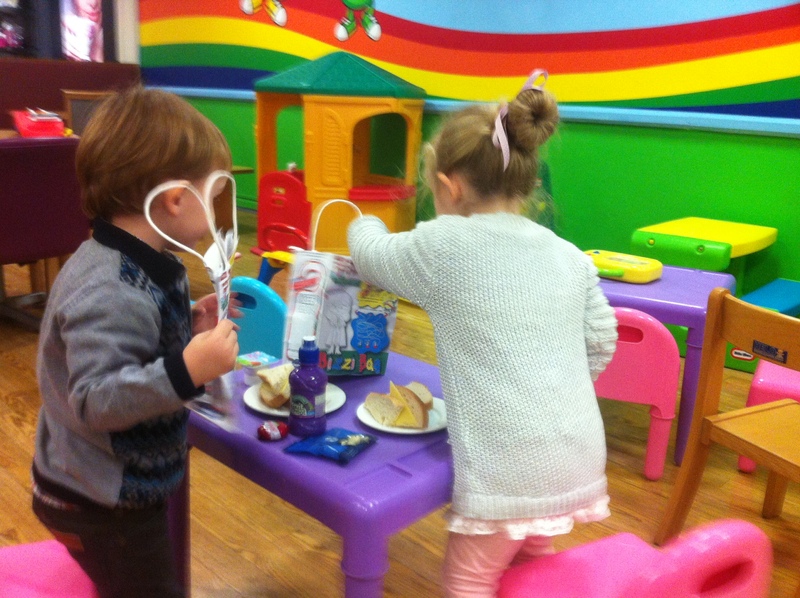 It has an amazing restaurant for kids, unusual really because it’s a bit of a toff’s shop with loads of expensive stuff, but the restaurant has a large playing area for kids, kitted out with loads of toys and tables and a TV which showed Peppa Pig non stop! Alfie and Millie were in heaven. 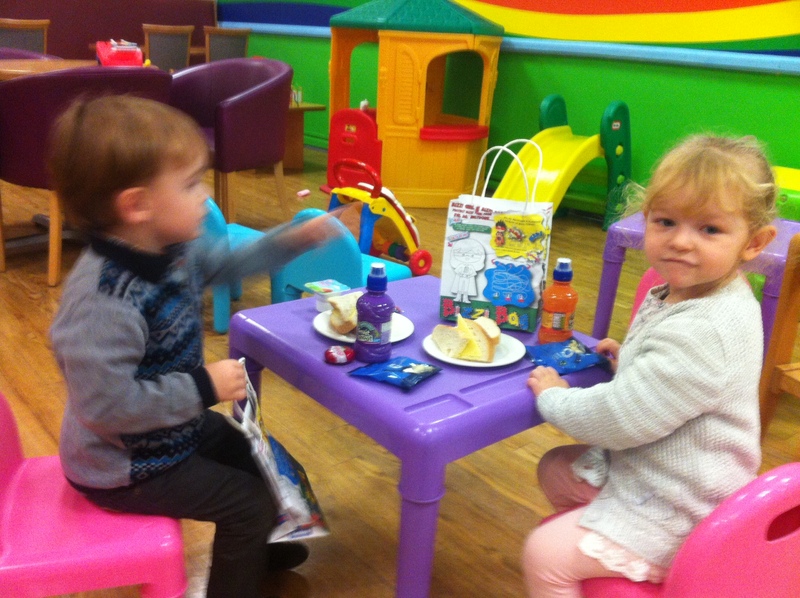 We enjoyed a snack while the two little ‘uns enjoyed a special kids meal! From here we walked quietly down to John Lewis with Alfie and Millie holding hands almost all the way there – it looked so very cute and drew numerous comments from many of our fellow pedestrians. 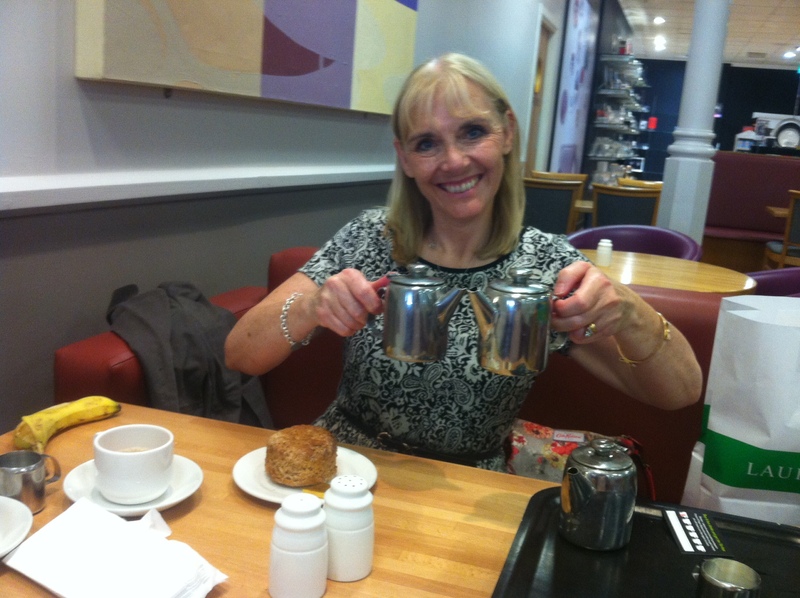 On the way we called into Clogau so the lady of the house could be shown how to do her new watch up… don’t ask! 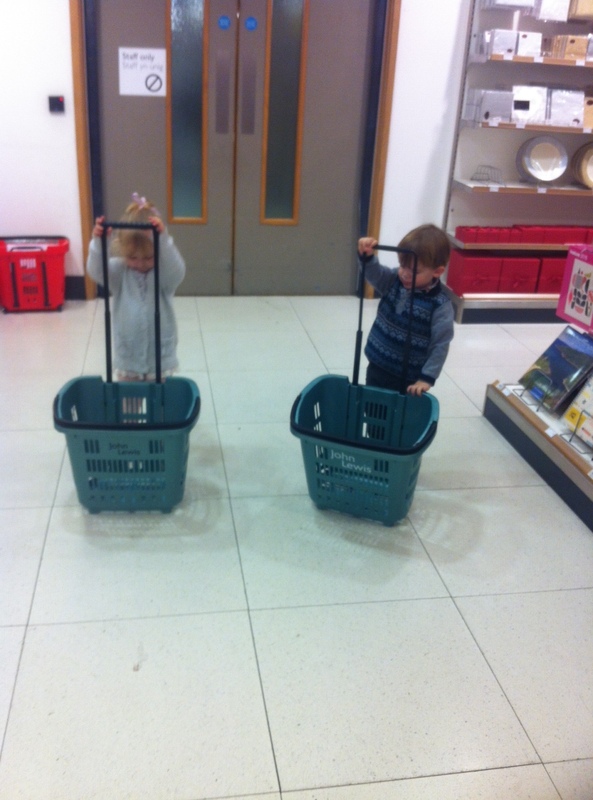 We we got to John Lewis we had great fun on the escalators, Alfie and Millie were amazed how high they were, I guess to their little eyes they were! We had great fun in this shop. 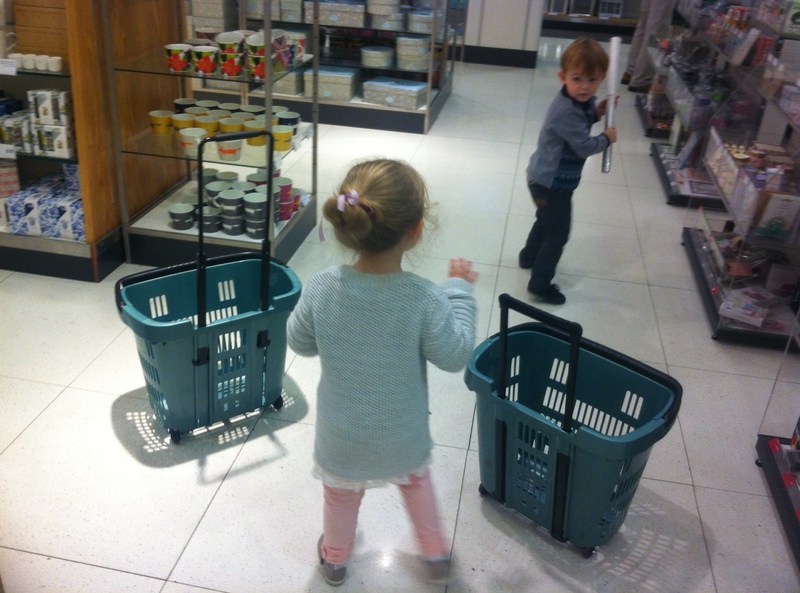 The kids found an old basket and after a bit of tugging and pulling, I decided they need one each and it wasn’t long before the whole department was in stitches and these two, like an old married couple were waking around filling their baskets with a range of goods. 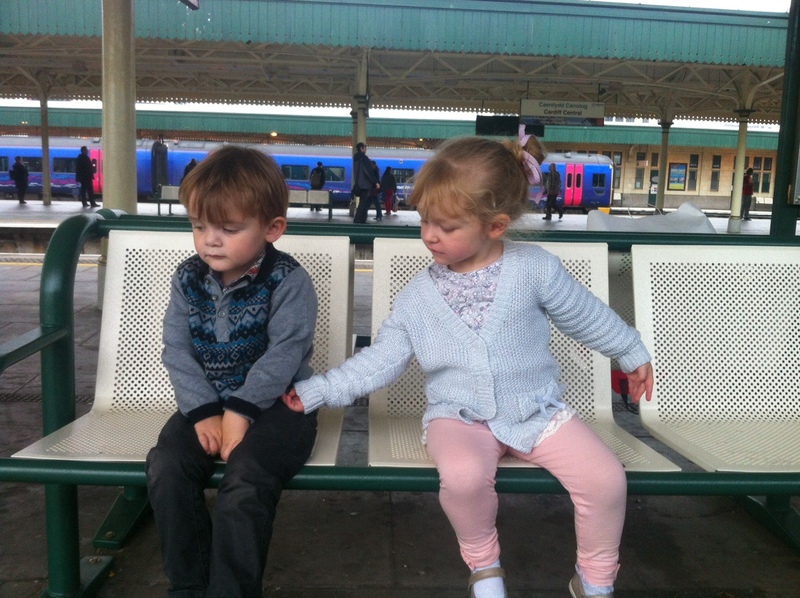 Alfie took great delight in advising Millie what she should have in hers. We made our way back to the station for the return journey. Still no ‘Choo, choo’, just another old turquoise diesel. 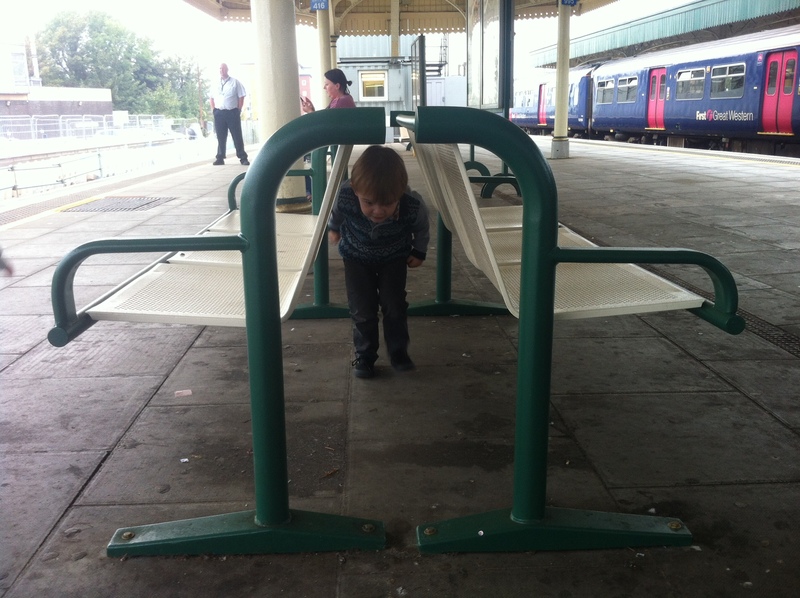 While we were waiting the little ones wasted no time in finding fun things to do. 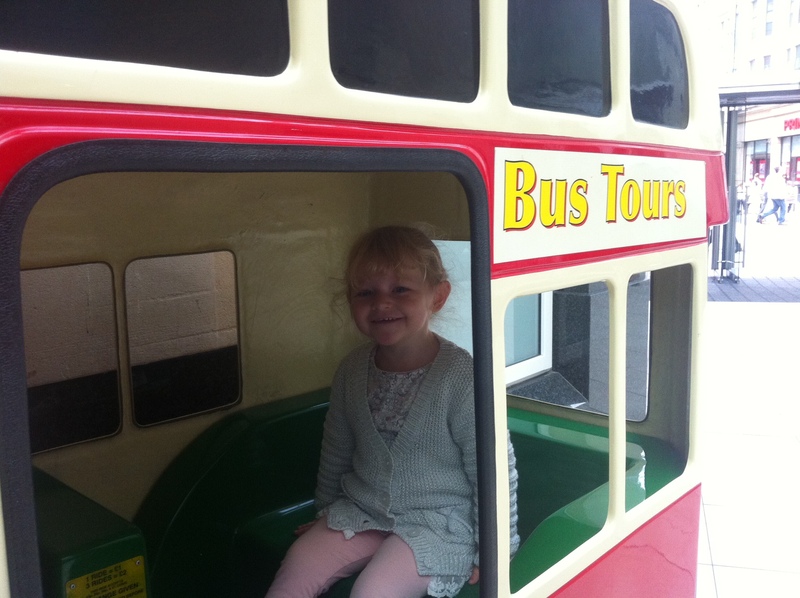 The amount of walking and playing they had done, meant two very tired children a much quieter return trip, but still loads of fun and loads of smiles and from all the other passengers. 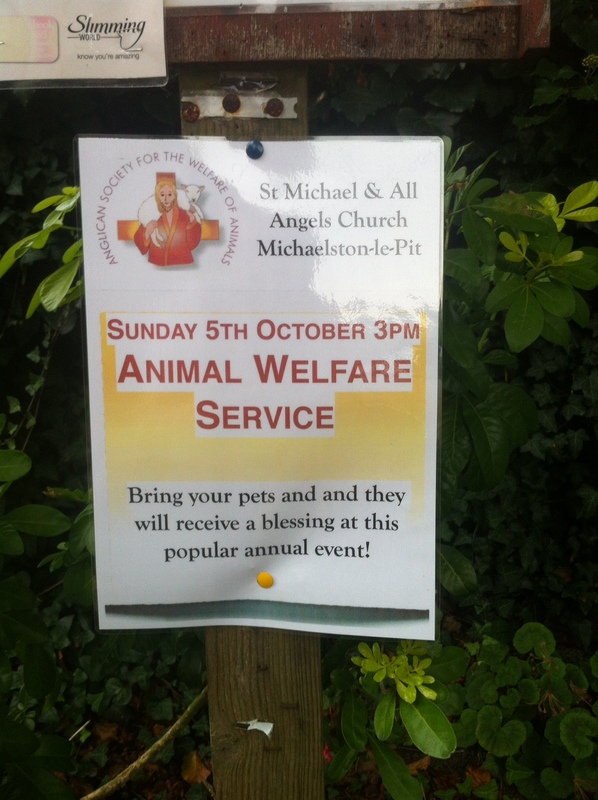 As we walked up our Close after leaving the train, we noticed an unusual notice on the Community Notice Board, I was wondering if Belle was in need of a blessing? If not Belle maybe Ellie or Toby? When we got home Millie asked if she could watch Snow White (498th viewing) but by the end of the opening credits both were breathing heavily, eyes closed and fast asleep. 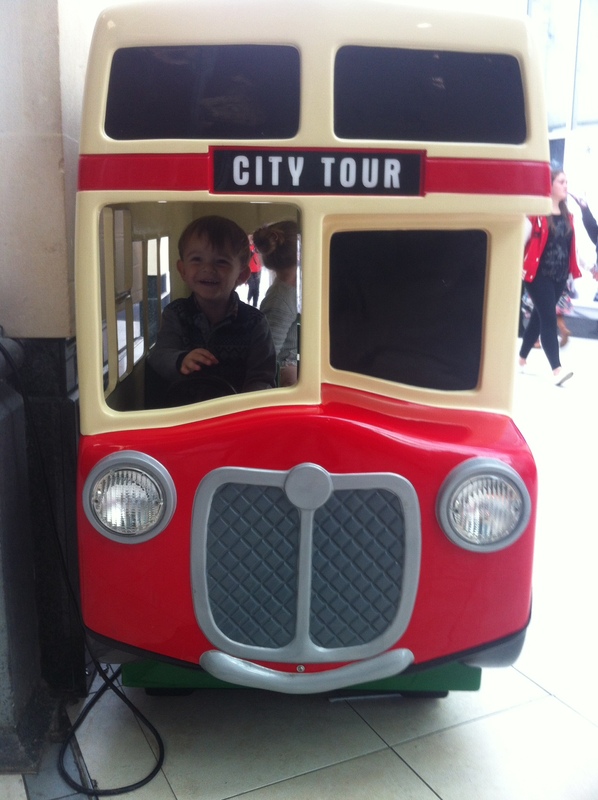 It was just an ordinary trip to town, made special by two wonderful little people who call us Nanna and Grampy or in Alfie’s case Nanna and Rog. We are so grateful for the time we spend with them – and so blessed to have them.